Thanksgiving is just three days away, and I don’t know where all my time went. Well, actually, I do know how I used some of it: making this casserole, twice, to get it just right so that if you decide to include it in your holiday meal, you can be sure it will work. And it will! It’s my new favorite dish, though my family won’t allow me to make it for Thanksgiving because they just had it twice in the same week. But that shouldn’t stop you from putting this delicious yet nutritious casserole on your holiday table. 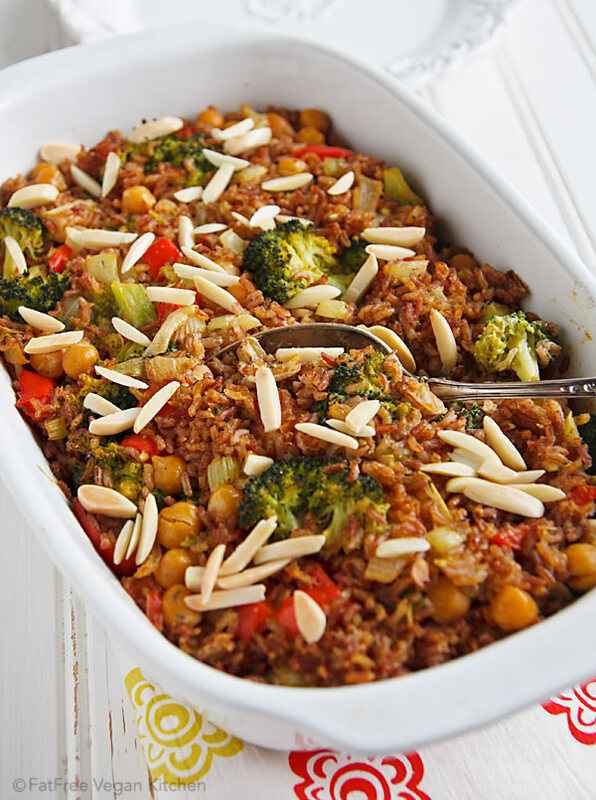 The standard broccoli-rice casserole usually contains white rice, chicken, cheese, and sometimes cream cheese, so the nutritional benefits of the broccoli get lost in a sea of cholesterol, simple carbs, and fat. Even vegan versions often contain Daiya or some other high-fat, processed vegan cheese, but not mine. There’s no cheese at all, and the only fat comes from seeds and nuts, which you can even leave out if you want. The first time I made the casserole, I used chickpeas and some Lotus Foods Madagascar Pink rice (a swag-bag gift at Vida Vegan Con). It’s a quick-cooking, lightly milled rice that looks almost red when it’s cooked, as you can see in my photos. 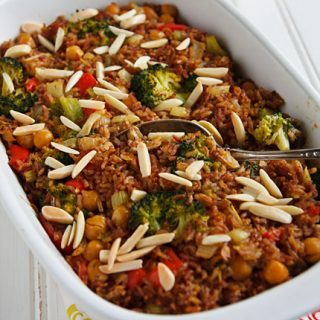 The second time I made it, I used ordinary brown rice and soy curls instead of chickpeas, and if I were going to serve this to non-vegans, that’s the combination I would choose. It’s not an elegant dish, but then again, neither is stuffing or sweet potato casserole. It’s the kind of rich, comfort food I look forward to at Thanksgiving–without all the fat and calories. So what are you serving? I’ll be traveling to my parents’ house with a green bean casserole, a double-layer pumpkin cheesecake, and a still-undecided protein dish (timbales? baked tofu? seitan cutlets?) with mushroom gravy. My mother will be handling the rest of the meal, which will include her cornbread dressing, my lemon pie (made with home-grown lemons), and, I hope, cranberry relish. It will be a feast of family and food! I hope your holiday is just as happy. You can put the casserole together ahead of time and bake it just before serving. Start with it at room temperature, if possible, and bake it long enough to be sure it’s heated through. If it starts to get too brown on top, cover it with aluminum foil until it’s hot. Preheat oven to 375. Lightly oil or spray a medium casserole dish (about 2-1/2-quart size). Place the broccoli in a steamer basket set over water and steam, covered, until just barely tender, about 3 to 4 minutes. Remove from heat. 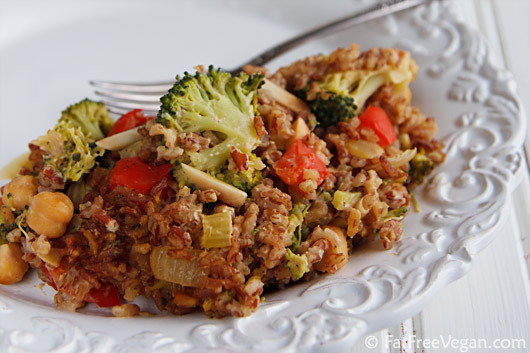 While the broccoli is steaming, heat a large, deep non-stick skillet or saute pan. Add the onion, bell pepper, and celery and cook, stirring constantly, for 4-5 minutes. Stir in the chickpeas, thyme, rice, and steamed broccoli. Make sure the sauce is well-blended, and add it to the skillet. Stir gently and cook until heated through, about 5 minutes. Check seasonings, adding more salt and pepper if necessary, and smooth into the prepared casserole dish and sprinkle with almonds, if desired. Bake until the top begins to brown, about 20 minutes. Serve hot. Nutrition (per serving, no optional ingredients): 288 calories, 34 calories from fat, 4.2g total fat, 0mg cholesterol, 305mg sodium, 383.2mg potassium, 50g carbohydrates, 5.2g fiber, 4.3g sugar, 17.9g protein. This looks so amazing and healthy, but I don’t have nutritional yeast on hand. Is there anything I can substitute for it? I really want to make it for dinner tonight! It’s going to lose the cheesy flavor without the nutritional yeast, but you could try making it and adding some extra seasonings instead. I wouldn’t exactly recommend that because NY is such a big part of the flavor. I made this for Christmas dinner. It was delicious, and we’ve made several variations since. Thanks for the great recipe. Our family loves your site. Dear Susan, I have enjoyed many of your wonderful recipes!! Thanks!! This is the latest I’ve tried. My husband and I both eat FF Vegan. He absolutely LOVED this one and so did I.
Hi Susan, I’m a huge fan of your blog, have posted just once a few days ago but didn’t introduce myself. I went from omni to vegetarian about 9 months ago and now follow an 80% vegan / 20% vegetarian diet. I’m an Aussie living in the Philippines and dining out (on business) even as a vegetarian is tough! So I really appreciate your blog, it’s the only one I follow and I love all your recipes. I try not to eat processed food, don’t like any of the meat substitutes and follow the principals of ETL as much as I can. This recipe took me about 10 mins just to assemble the ingredients – probably about 30 mins total prep time. I’m not a fan of nutritional yeast at all but was inspired by such positive reviews! When I poured the sauce over, I was sure this would end up in the bin – the smell of the NY was so strong! But it tasted great – I could still taste the NY but I really enjoyed the texture and “heartiness” of the dish. It was very satiating. I added some chopped spinach, mushies and some of my favourite spices. Keep the recipes coming and well done on running such a successful and much appreciated blog. …..also I threw in a little bit of wild rice, and used hemp milk, which I like better than soy. It was delish! That’s sounds delicious! I’m so glad you liked it. I made this tonight with unsweetened almond milk (don’t use soy too often), 1/2 cup of raw soaked cashews in the sauce in lieu of cashew butter) and it was incredible! Hi Susan! This looks really good and I plan on making it. Do you think I would be able to make this and freeze it? Or do you think it would be dry? I haven’t tried freezing it, but I can’t see any reason why it wouldn’t work. Perfect! Thank you for responding. I made this dish this weekend and it was delish!!!! Just makes too much for on person 🙂 My family cant stand the smell of NY, therefore are unwilling to try it. Just made this and it was great! Thanks! I tried this recipe and it did not taste great for us, I don’t know if it is the taste from the nutritional yeast. YUM! Made this for my house of 15 people tonight and it was loved by everybody, even the non-vegans. And it’s gluten free! I doubled the recipe and used two things of tofu instead of chick peas and a tad less brown rice. It all fit nicely in a 9×13 glass pan. I was worried that there would not be enough sauce for both batches, but once I added it, everything came together so nicely. The sauce is really yummy too and could stand on its own. It could work well if used to douse a bowl of macaroni or a steaming baked potato. I ended up adding a good bit of extra salt at the end. The nice thing about this recipe is that I can make it the night before and pop it in the oven when I get home from work. And it’s super easy to prepare. People love it because it’s hearty and warm and filling. What a wonderful meal for a cold Wisconsin night! I made this last night and it was fabulous! I added cremini mushrooms which I thought went very well. Also I ran out of rice, so I used orzo pasta instead. It was perfect! Thanks! This is just so yummy! I made this for the second time over the weekend and it was a big hit with everyone. I did add a little bit of sweet chilli sauce for the families taste buds, but along with your cauliflower and sweet potato soup, I see them hounding me for this again in the not too distance future. This is DELICIOUS! I am a first timer to your site and if any of the other recipes are like this (and I am assuming they are by the looks of ’em) I am hooked. Thank you for a marvelous dinner. Cheers! I cook my brown rice in a rice cooker and follow the manufacturer’s instructions (about 1 1/2 cups rice and 3 cups water). It usually cooks for about 45 minutes. Was the whole casserole mushy or just the rice? I think what happened is that i followed the manufacturer’s directions and it called for too much water. I’ve cooked brown rice before but it had been such a long time that i had to look up the directions. I remembered the cooking time just not the water amount. So i had to cook it longer than 45 minutes since there was still water at the bottom of the pan.Which resulted in the rice being a big mushy ball. It was hard to mix it with the other ingredients which just turned everything into a much. Despite all that it was still absolutely delicious! Instead of slivered almonds i grounded mine and sprinkled it on top. Learnt my lesson! Next time I’ll get the rice right! I’ve been vegetarian most of my life, but my husband and I became fat-free vegans after he suffered a cardiac arrest/MI/5-way CABG (statistically less than a 1% survival rate for this type of event, but he’s back at work and doing great!) in November of 2011. It’s been a hard transition for him–diet-wise, and in several other ways, besides–but your blog has helped enormously. While we’ve tried and enjoyed so very many of your recipes, I had to comment on this one, as it is truly outstanding! It can stand up to various substitutions and tweaks depending upon personal taste and ingredient availability, keeps and freezes extremely well, and isn’t obnoxious to put together. The sauce is *amazing*–just incredible over baked potatoes, pasta, quinoa, steamed vegatables, and even over scrambled tofu for a vegan version of eggs benedict! Thank you so much for this, and all of your recipes–they are lifesavers in the truest sense of the word! I just made this and it was delicious! (I didn’t change anything except for omitting the sherry which I didn’t have on hand and replacing the mustard powder with a 1/2 tablespoon whole grain Dijon mustard.) My husband is usually not the most enthusiastic about vegan recipes, but he loved this one! Keeper! I’d like to make this ahead of time by a few days and bake it as the last step – on the day of. Will it go bad? Thanks for the info on nutritional yeast. It really is kind of tasty. Who knew! Keep it refrigerated and I think it should be fine. Enjoy! I made this the other day and while my boyfriend and I thought it was fairly tasty, we both agreed it needed a bit of an extra “kick” as it was a bit too bland for us. We followed the recipe exactly and would definitely make it again, but with a few adjustments/additions. This is the best recipe I’ve had on our plant based fat free vegan diet so far! Made this for dinner tonight and thought it was awesome! I will definitely be making this again. Thank you for sharing. Oh man. This was so good. I used some frozen seitan that I had on hand instead of chickpeas. The creamy sauce was such a surprise! Mmmmm. Will definitely keep this in the repertoire. I just prepared this casserole and put it in the fridge to cook for tomorrow night’s dinner… DELICIOUS!! I couldn’t stop “testing” it before I put it in the refrigerator! The sauce is SO good! I want to put it on everything!! I’m already trying to think of other ways to use it… over veggies? noodles? potatoes? Thanks for another amazing recipe! I LOVE your blog!! Hi. I’m so happy to find this recipe. I’m going to try it tonight, even though it’s still technically summer. It’s already fall here (BC) weather-wise anyway. We have an abundance of broccoli from the garden, so I was looking for something vegan, but like you said, everyone adds fake cheese to broccoli dishes. I really never use the stuff. I’m trying to stay away from processed food as much as possible, and fake cheese just seems odd to me. I’ll be checking out many of your other recipes too. I think I’m going sub cooked lentils for the chickpeas, so I’ll let you know how that goes. This is really yummy and satisfying. Mine didn’t come out as pretty. But still, yummy. Needed a good pre-Thanksgiving recipe this evening and this looked good, but it was great!!! Definitely a keeper that will be made often. Thank you. Oh my goodness, this is so good! I made this for a Thanksgiving potluck and it was gone! My husband begged me to make this again just for us. I love this dish! Thanks for posting! Hi Susan. I made this for Christmas dinner. Wonderful addition to all of my other veggie dishes. Your recipes are always so reliable. Thank you. I just wanted to say this recipe is so good. I made it a second time, more creamy, and I have to say it was so close to something I would of liked in my passed eating ways. I am always looking for comfort food that anyone would like, not just us crazy fat free vegans. Thank you so much. I made this for lunch today & both my husband and I liked it. I didn’t want to wait for brown rice to cook, so I used 1 cup millet, cooked according to the package directions and added that in place of the rice. I think it was a tasty substitution and I may make it that way again. Someone’s suggestion to add mushrooms sounds good also. Could you substitute something in place of the broccoli? While I do love broccoli, it just doesn’t really love me back ha. Would zucchini work? Zucchini will probably work. It’s more watery than broccoli, so that may cause the casserole to be a little moister. This is a lovely recipe. Thank you! I’ve recently given up eggs, dairy, and soy so I can continue to nurse my son. I’ll make this recipe again, and I look forward to trying some of your other dishes! Susan, this was amazing. Unbelievably cheesy and so good for you. I cooked my rice in a little no-chicken broth base. I diced some roasted red bell peppers and substituted red kidney beans instead of chickpeas. With my Vitamix, I was able to blend some raw cashews into the sauce. I did saute my veggies in a little bit of olive oil. I know oil is bad, but I just love a little bit for mouth feel. Thanks for creating such an awesome site! I doubled all the spices and used roasted red pepper hummus instead of tahini and liquid smoke in place of smoked paprika. It is a delicious, keeper recipe that will be well received today. Thank you. Susan, Your recipes are genius! We served this Broccoli Casserole, your Garden Skillet Pie, Impossible Pumpkin Pie, Applesauce Ginger Cake, and Cranberry Relish at Thanksgiving yesterday, and all were hits with vegans and non-vegans alike! Thank you for your blog and recipes. You make it so easy to cook for our vegan/carnivore family! And your mushroom gravy is the best food on the planet! I just made this recipe for the first time tonight and it turned out wonderfully, and I didn’t even add the almonds or tahini. The only changes I made were to use a whole red bell pepper, a mix of brown and black rice, double the dry mustard, and a large head of broccoli from my garden (about 7 cups worth). I also used flax milk instead of soy, and accidentally dumped in a few tablespoons of cooking sherry, which I thought would ruin the sauce but it didn’t. Some mentioned that this requires a lot of pots- here is how I cut down on that. I used one pot to cook my rice while I chopped & prepped everything else. My second pot was my large enamel coated cast iron pot (5 quarts). 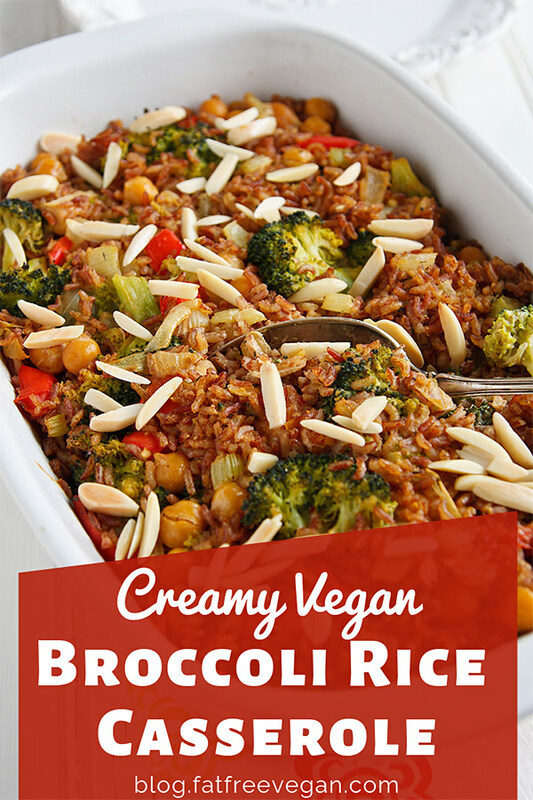 I used it first to steam the broccoli, then put the broccoli in the strainer and used the pot to cook the onion/pepper mixture, then stirred in the chickpeas, rice, broccoli & sauce, and then baked the whole thing in the same pot in the oven. How does one ACCIDENTALLY dump in cooking sherry! Are you sure it wasn’t some fine wine that you were sipping at the moment? 🙂 Too cute. This is so fantastic!! Vegan and non vegans will love it!! So hearty and delicious. Thank you!! Thank you so much for sharing this recipe, I have been transitioning to Vegan from Vegetarian over the last 6 months and finding recipes like yours is awesome. First time I have ever gotten right up and made the recipe after reading through it. Have an awesome day, this turned out so yummy. Thanks again. Susan, I made this tonight, and it was great. It would be perfect at a holiday dinner. I didn’t have rice, so I used bulgar, and it worked perfectly. It took a bit longer than the 10 min. prep time, but worth it. Thanks for the recipe, and for all of your great recipes, and my best wishes for your good health. I tried this recipe yesterday and it came out wonderfully! Definitely will repeat again. Thank you very much for the wonderful recipe. Keep up the wonderful job! So I was in the store and saw cauliflower “rice” and immediately thought about your recipe and replacing rice with the cauliflower. It’s In the oven right now. I snagged a quick taste before I put it in and tasted just as great! Can’t wait until it’s done! I’ve made this a few time over the years, but just recently made a few to freeze before baby. I used boiled potato chunks instead of chickpeas, and they subbed in great! I would recommend increasing the amount of sauce a bit if freezing, but it held up well and freezing in a muffin tin makes it easy to portion- we defrost 2 pucks for each of us, one for the toddler! Such a nourishing meal to have on hand. Thanks for sharing!! Such a great idea! Thanks for posting! This looks fantastic, thank you! I’m going to make it for Christmas – I’m in Canada and we celebrated Thanksgiving in October. I’m SO glad I found your site, you make is possible to have tasty dishes even on a vegan, gluten-free, oil-free, dairy-free diet!